This week it was Julie's turn to set the challenge for SALT and I had to "scold" her about her chose of "Speaking with Kindness" because this topic hit too close to home! The Lord likes to work that way...Bringing up topics for study where you are lacking....even when you didn't really want to think too much about said topic. :-) Julie shared a wonderful paragraph from the book, The Virtuous Woman, Vicki Courtney on a chapter about speech. "A virtuous woman . . . speaks with wisdom because because she wisely considers her words before she opens her mouth. 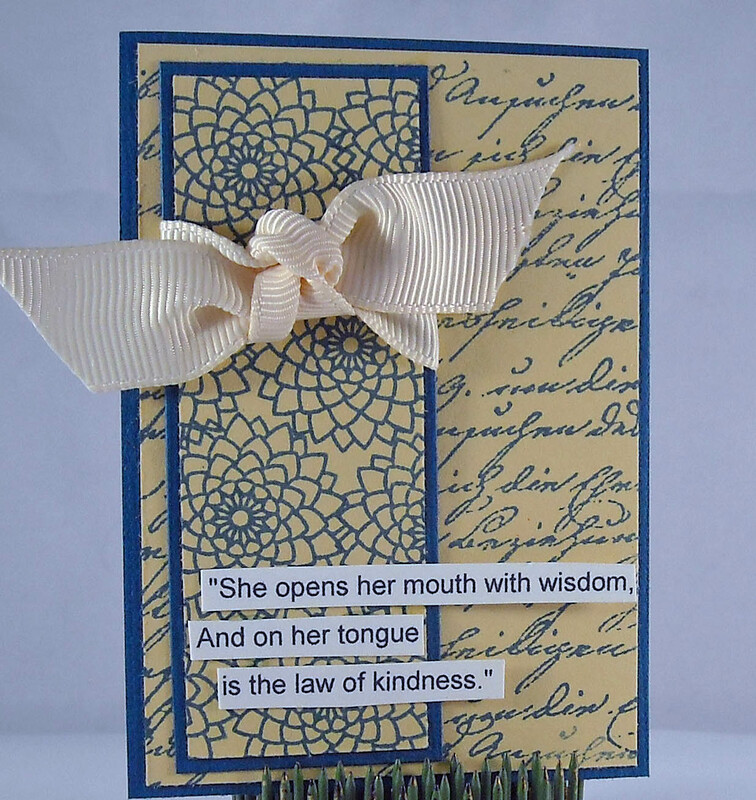 When in the presence of gossip or hearsay, the law of kindness remains on her tongue. With an awesome fear of the Lord, she is quick to remember ' that men will have to give account on the day of judgment for every careless word they have spoken' (Matt. 12:36)." Wow...how convicting to consider that we'll have to give an account for even the words we've spoken. I'm not sure I noticed my words much before having children. After...sigh...it can be a challenge to speak with kindness and love when both of your children are pushing all of your buttons, at the same time while you're trying to cook dinner or do some other activity. It's also really hard if you're a person who struggles with being patient (humm...I don't know anyone like that...). I notice it even more when I hear the boys talking to each other in an unloving way. Not that they're not responsible for their own actions but certainly they copy what their parents do more than they do what they say. It makes me think of parents who tell their kids not to smoke while they're lighting up...The same holds true for when we tell our children to be kind of one another and yet as parents too easily lose our patience of fail to respond in a loving manner. Just last night, after having a difficult day with our oldest, I thought to myself...When he responds in anger, I must respond in love. When he responds with impatience, I must respond in love. When he doesn't obey, I must respond in love. For isn't this an example of what Christ has done for His people. When we were rebellious, loving ourselves more than anyone else, when we failed to obey God's commands and preferred to indulge our sins, when we ignored the One who gave us life and all that we have....He responded in love, humbling Himself and giving up His life, even though He had done nothing wrong; simply because He so loved His people. If Christ did all this for me then surely I can rise to the challenge of speaking with kindness to those around me. May God be pleased to empower us to do those things that He calls us to! As for my ATC...it was a quick creation, using a Tim Holtz script stamp and a flower stamp from Waltzingmouse Stamps, Big Blooms - Chrysanthemums. My Scripture verse was printed out on my printer. I went with a two-color combo this week and love the idea of keeping things simple and bold. The SALT team created some amazing projects this week so take a quick peek on the blog and if you're feeling inspired by this week's challenge, then please leave us a comment with a link back to your blog or gallery. Enjoy! Greetings all! I should start this post with apologizes that I didn't get a photo of the side of this card as it's not easy to see the "steps" in my card from just the front...humm...have to work on that! This is another card from my class a few weeks ago and while I'm not a big halloween person, I couldn't resist these glittery pumpkins and ghost stickers that arrived in the store earlier this month. Aren't they fabulous? (We have sparkly snowflakes and snowmen too!) My step card is covered with numbers from SU! (a retired set), background stamps, birds, crowns, and sentiments from Tim Holtz, and darling glitzy paper from (I think) Imaginisce. 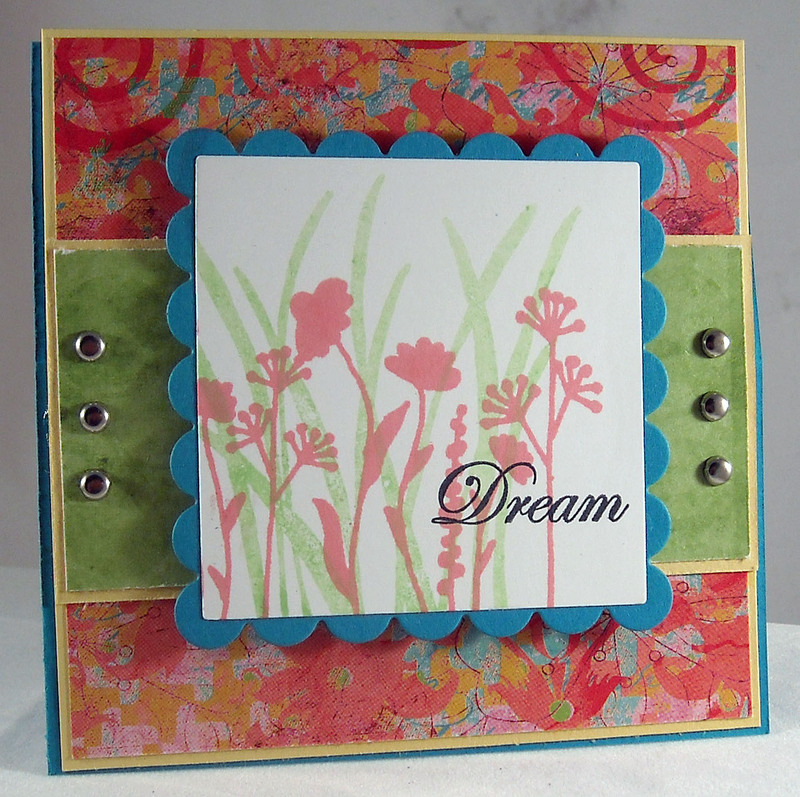 The middle panel is showcasing some fabulous swirls from Papertreyink. And how to do you like my choose of sentiment? Funny, right? Hopes, fears, halloween...Oh, I'm just so clever! LOL! Want to know how to create a step card? 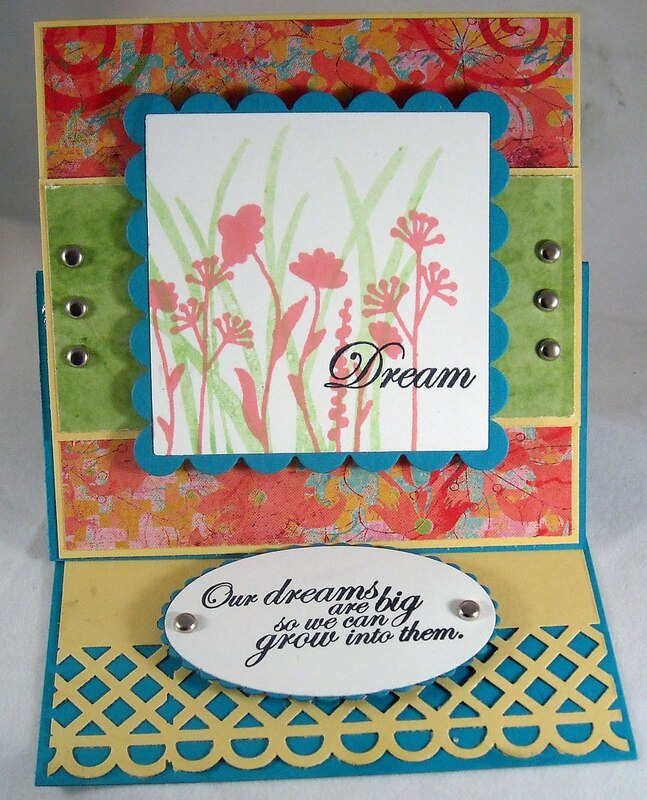 It's super easy, just follow these directions: Start with a card base of 11” x 5.5 “ Score at 2.25”, 5”, 7”, 9”, & 10” Accordion fold the card to create the “steps” Decorate each step How is that for quick! The hardest part of this card...deciding what fun embellies to use to decorate! It's going to be a busy week on the blog over the next two weeks...good news for those of you who are following Paperie Petals! :-) The SALT challenge post will be live on Thursday and next week is the new Tiffany Doodles challenge! Stay tuned.... Enjoy! Tap, tap...is this thing on? Anyone still out there in the audience since I've sorely neglected my blog this week? :-) I think this might be a sign of things to come...Feel like I have so many things going on that it's hard to keep up with specific posts for the 'ol blog! However, I'm still teaching at Wholly Scrap! 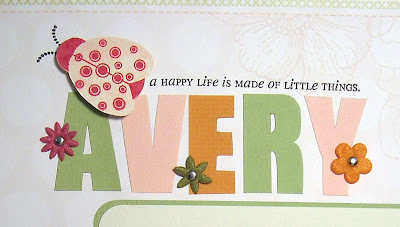 and am happy to share those projects here, especially when they include Sweet 'n Sassy stamps! This is a card that I taught last week, where we created fun card layouts...Ones different than the traditional 4.25" x 5.5" format. 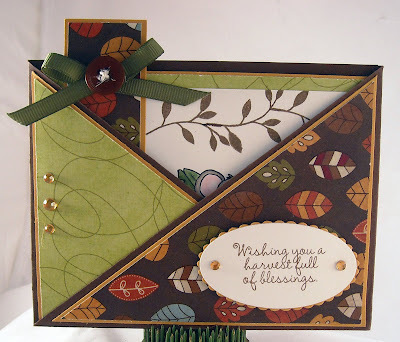 This is called a crisscross card and you can find directions for how to make this on Splitcoast. These fun cards include a pocket and postcard insert. Good morning everyone! I hope you all had a lovely weekend...I was working, which is actually quite fun when you work in a scrapbook store! And then we enjoyed a blessed day at church yesterday, after which I came home and promptly took a nap! 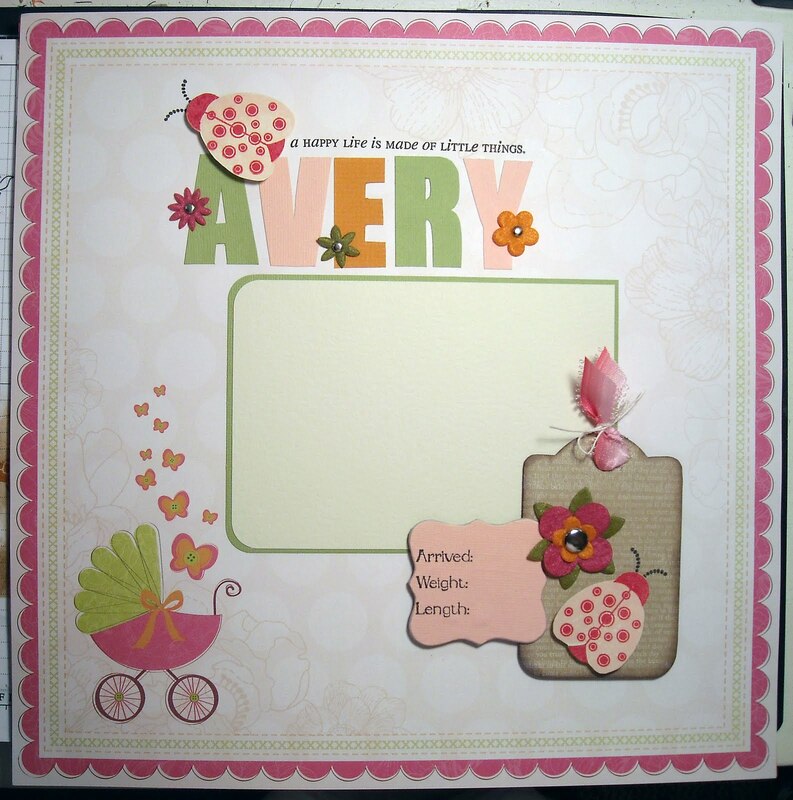 :-) I had hoped to share another one of my class cards today but I guess I didn't take the photos yet so...I'm happy to instead share the first page of my custom scrapbook album. 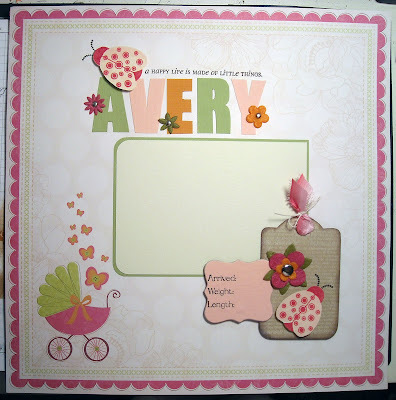 I took on a big project for one of our customers; creating a 30-page scrapbook for a first baby. The husband is actually creating this for his wife, as a big surprise! Great idea, right? Of course it's going to be a real surprise since it might take me until the baby's first birthday to finish! LOL! No really...but it is a big project...I'm just about half way done and am hoping to finish a bunch of pages this week. This is the first page of the album, which will feature a lovely photo of the new baby (they know they're having a girl) along with her name. I'm bringing this ladybug theme throughout the entire album (every page will have a ladybug) as the mom is a fan of ladybugs....that might be the nursery theme too. 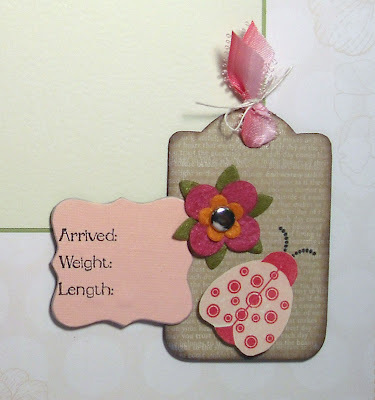 The ladybug image is from one of the very first Papertreyink sets...love this one and it's worked perfectly for the album. Here's a close up of the tag, which features the baby's weight, etc. And here's a close up of the name...I didn't have any letters that were big enough for the page (filling those 12x12's is no easy task!) so I printed out a font on my computer, cut out the letters, and then traced them on cardstock and cut them out again. Perfect! These sweet felt flowers are from SU! The rest of my supplies were purchased at Wholly Scrap! I'll be back later with more of the pages...Here's hoping I get another 10 done today!! (OK, I'll be lucky to finish two!) Enjoy! Is this not the cutest image ever!? I adore snowman images and this one puts a smile on my face every time I look at it! 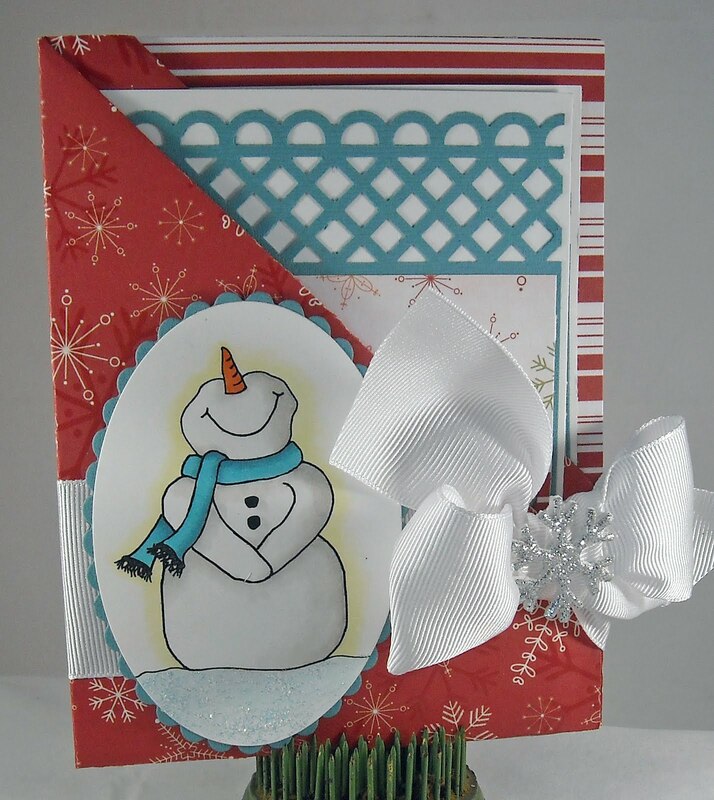 This sweety snowman (called Smiley Snowman) is available as a digital download for just $3.00! That's another reason for joy! This is a card that I taught at a class last night, where I demonstrated different card folding techniques. This is a double pocket card and inside are hiding not one but two individual cards. It's like a 3-in-1 card! I printed out Mr. Smiley Snowman a second time and just highlighted his sweet face on the inside cards by only punching out the top portion of the image. A Merry Christmas sentiment was all that was needed to finish the inside piece. I tied a huge bow (love those big 'ol bows) around the entire card and added a sparkly snowflake sticker for a little bling. This card almost makes me long for snow...almost... Want a tutorial on how to make this double pocket card...click here! Enjoy! 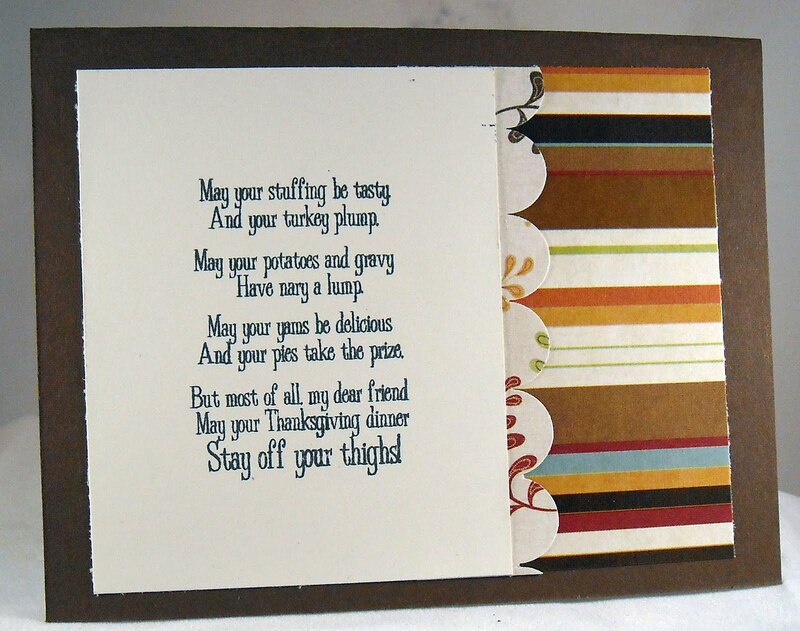 I simply had to share one of the sentiments from the Gobble Gobble set...it's hysterical!! You should be able to read it ok in the photo...click on the photo for a larger image! Well my friends, if you get a chance hop on over to SCS and participate in today's sketch challenge...we'd love to see what you come up with!! Enjoy! It's another card from my class last week! 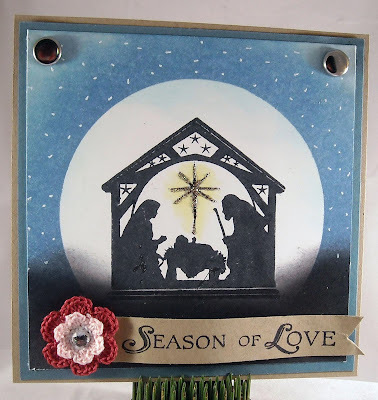 Seems that's about all I've been stamping lately but that's ok...all of my cards have included fabulous stamps from Sweet 'n Sassy and this card is no exception! 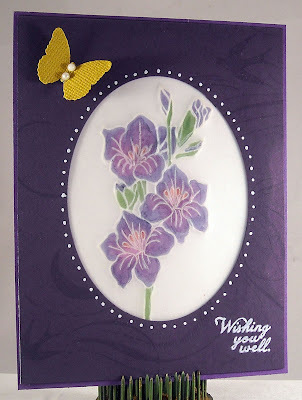 The image on this card is from the August Gladiola set, which includes this beautiful flower image and five sentiments. And did you know that SNSS has a flower stamp set for each month of the year? Fun stuff! This was a technique called parchment paper and is created using a piece of vellum cardstock and white ink. To create this look, first stamp your image in white ink (I used PTI's white ink because it's the best!) on a piece of vellum. Once your ink is dry, turn the vellum over and use the small end of an embossing tool to retrace the stamped image. This is important...you'll need to do the tracing on top of an soft or mouse pad so that the image ends up being embossed. (Trace carefully as vellum tears easily) Once you've outlined the image, use Copic markers to color the image. Again, you're working on the back of the vellum, the side opposite from where you stamped. Once your image is colored, you can add other plain embossed elements or piercing to the vellum...whatever suits your design style! I went with an oval frame for these pretty flowers. I keep the card design fairly simple and only added a stamped image on the outside of the frame (a background stamp from SU! ), some white polka dots, added with a white gel pen, and a sweet bright yellow butterfly. The sentiment is from the same SNSS stamp set as the gladiola stamp. Enjoy! Kick stand card (at least I think that's what it's called!!)! For my card I used some lovely designer paper from Creative Imaginations....I have yet to grow weary of this line, so many great colors and designs to choose from. 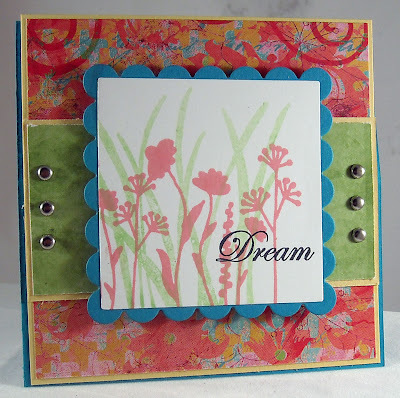 My stamp set, a Sweet 'n Sassy set, is called Serene Silhouettes and it's one of my favorites. 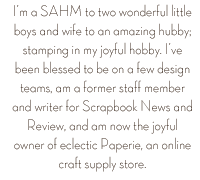 One I reach for again and again...As for using SNSS stamps during my class...it's because Korin has decided to start selling to wholesale accounts - yippee!! It's been a blast to be able to offer her darling stamps to our customers. The first month...her sets were sold out within two hours!! Looking forward to stocking our shelves with more of her crafty goodness! Speaking of stocking shelves...I'm off to work shortly so I need to hurry along!! Enjoy your day!! It's time for another Tiffany Doodles challenge!! Did you participate in last month's challenge? Did you know that you have an opportunity to win oodles of free digis if you play along with our challenges? Fabulous!! This month we have a color challenge...one of my favorites! For reference, I'm sharing the colors below: Humm...do you see any black in that color challenge? Yeah, me either! 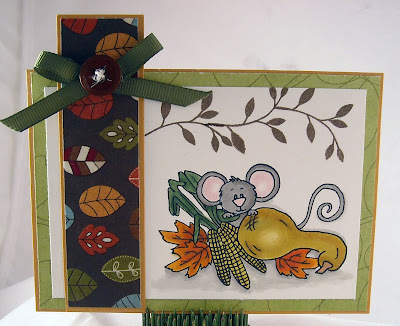 ;-) But once I added black to my card, I just fell in love so...my challenge has a bit of a twist!! (One of the other design team members used a touch of black too...can you find out who it was?) This sweet cake image, from the Let Them Eat Cake set, is so much fun! The set contains the cake plain, a cake with the trim around each layer, or with polka dots all over...whatever you want! 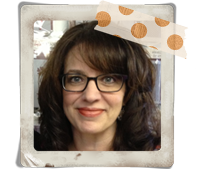 I chose to go with the image that only had the trim around the layers. 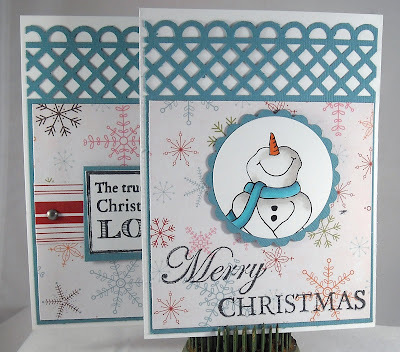 I then used two different size punches (1/4" and 1/8") to create the polka dots out of the challenge colors. Tiny self-adhesive pearls finished off the cake decorations. 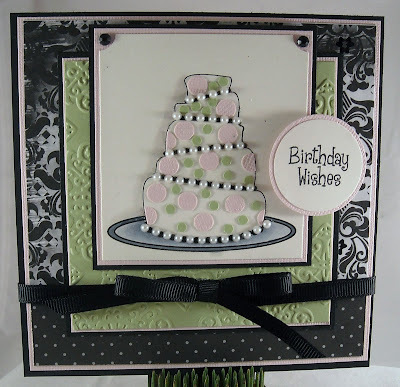 I dry embossed a piece of green cardstock for a little extra umph and adding a sweet happy birthday sentiment from Sweet 'n Sassy. The black & white designer paper is from Imaginisce. And now for the challenge details!! Here are the rules of the challenge: Start date: Today, Setpember 7 End date: September 30, Midnight EST Winners Announced: October 1 Don't forget to add your card to the Tiffany Doodles Flickr Gallery! Tagged with: TD04 The Prizes! You have 4 chances to win up to 7 digis of your choice from Tiffany Doodles! 1st place - 7 digis 2nd place - 5 digis 3rd place - 3 digis 1 Random - 3 digis Want to see what the rest of the team came up with? You're in for a treat, their designs are amazing! For details on any of the team cards just click on their name to visit their blog! Tiffany Cammy Deirdre Donna Julie Lindsay Peet Ruby Shannon Vanessa Virginia Enjoy and be sure to stop by the Tiffany Doodles site to enter your card into the prize drawing!! I keep running late with my Keep it Simple posts - so sorry! We had company over last night and after far too much snacking and not enough visiting, I only had energy left to crawl into bed and fall fast asleep! 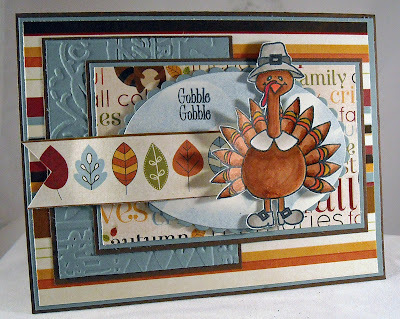 :-) For today's card, I'm showcasing the reflection technique, which is a technique that I'll be demonstrating at an upcoming Wholly Scrap! class. Now before you cry, "this isn't an easy card!" I will assure you that it really only took me a few minutes to create! 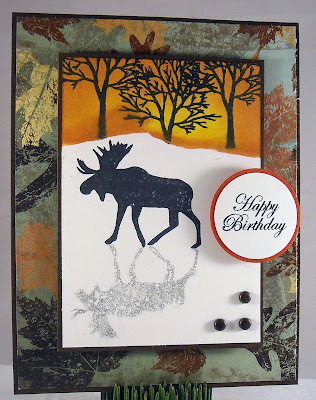 Like I start all silhouette projects, I went searching through Michelle Zindorf's excellent tutorial web site to see if I could find something that would work well, especially since I know she's done many cards with reflections. Once I found a tutorial, I got to work! The only portion of this card that took any time to create was the sunset/trees section but even that is very easy. I used a torn piece of paper to mask off the bottom portion of my cardstock before adding ink with a blending tool. 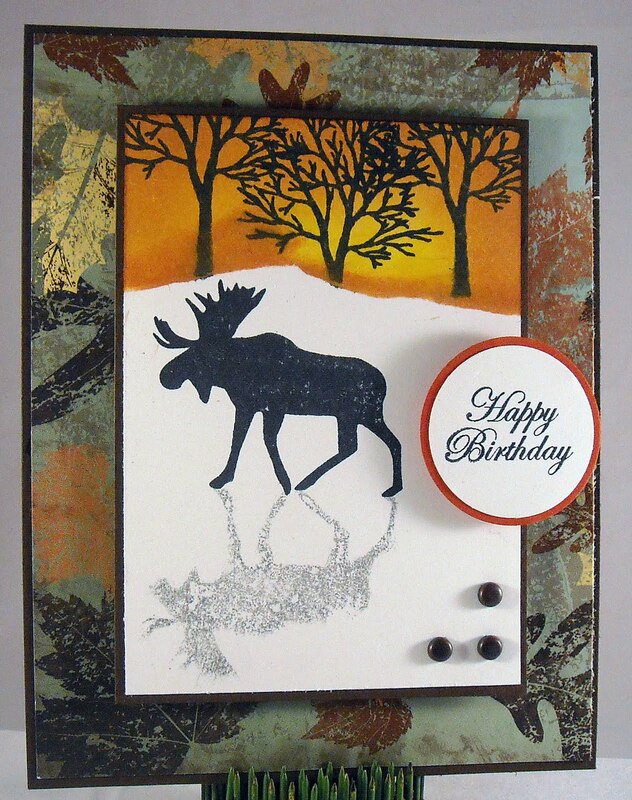 The trees, which are from a brand new Sweet 'n Sassy stamp set, Forest Silhouettes, (all images are from the same set) were stamped in black over the inked portion of the card. I then only needed to add the moose (perfect for life in NH, no?) and then came the reflection. Know how to get that reflection? I didn't actually until reading about it on SCS and on Michelle's blog. You'll need a Stamp-a-ma-jig (from SU!) or some other piece of thin, clear plastic. Stamp your image (in my case, the moose) on the plastic from the Stamp-a-ma-jig in a lighter ink color (I used a gray), turn the plastic over, line it up with the bottom of your already stamped image, lay down the plastic and gently rub over the image that you stamped on the plastic. And then you have a perfect reflection! Very cool! All that was left to do was build my card, using some brand new paper from Wholly Scrap!, a sentiment, and a few brads. And you know what else I just realized? I made a guy card...what do you know, I never do that!! :-) Enjoy! Welcome to another SALT challenge! Have you had a chance to play along with our challenges? 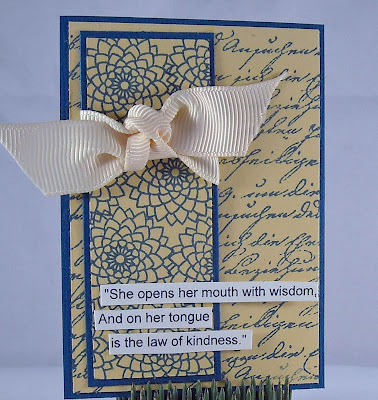 To do so, just visit the SALT blog, create a card or scrapbook page based on the weekly challenges, and leave us a comment with a link back to your blog or online gallery. This week it was Hazel's turn to set the challenge and she chose "Something New", which is a fantastic theme! 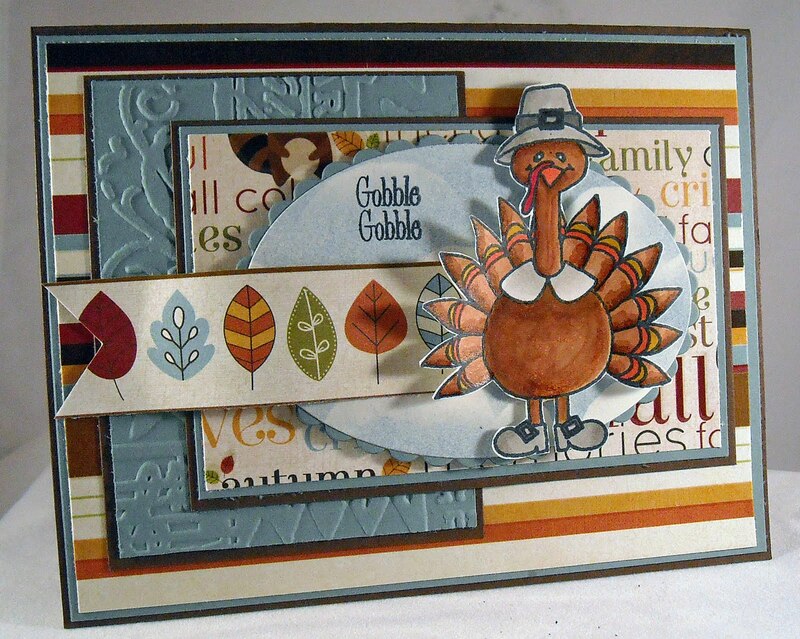 Stop by the SALT blog to read her lovely write up and see her scrapbook page, dedicated to her Father...beautiful! 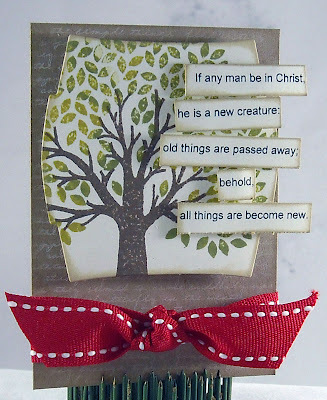 When I think of new beginnings the first thing that came to mind is having a new life in Christ. My ATC reflects the verse that I immediately thought of when I heard the challenge, it's from 2 Corinthians 5:17. I believe this is the greatest promise of the Gospel, that by trusting in Christ, you will be transformed. Matthew Henry shared these helpful comments on this verse..."The renewed man acts upon new principles, by new rules, with new ends, and in new company. The believer is created anew; his heart is not merely set right, but a new heart is given him. He is the workmanship of God, created in Christ Jesus unto good works. Though the same as a man, he is changed in his character and conduct. These words must and do mean more than an outward reformation. The man who formerly saw no beauty in the Saviour that he should desire him, now loves him above all things. Peace has been made by the cross, God beseeches sinners to lay aside their enmity, and accept the salvation he offers. Christ knew no sin. He was made Sin; not a sinner, but Sin, a Sin-offering, a Sacrifice for sin. The end and design of all this was, that we might be made the righteousness of God in him, might be justified freely by the grace of God through the redemption which is in Christ Jesus." For me, nothing seems quite as glorious as knowing that my formerly pride-filled heart has been changed. And that change did not come through my own will (for I never knew I was that way!) but only by the work of the Holy Spirit who opened my eyes and made me see my need...Praise be to God alone! 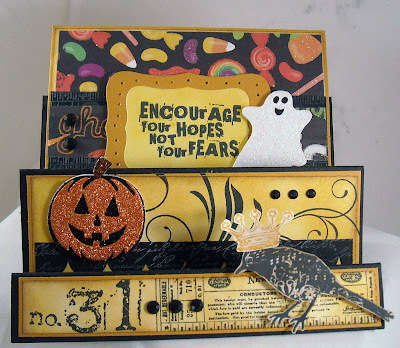 My quick little ATC was created using stamps, ribbon, and ink from Papertreyink. Please stop by the SALT blog to see the rest of the design team's lovely creations! 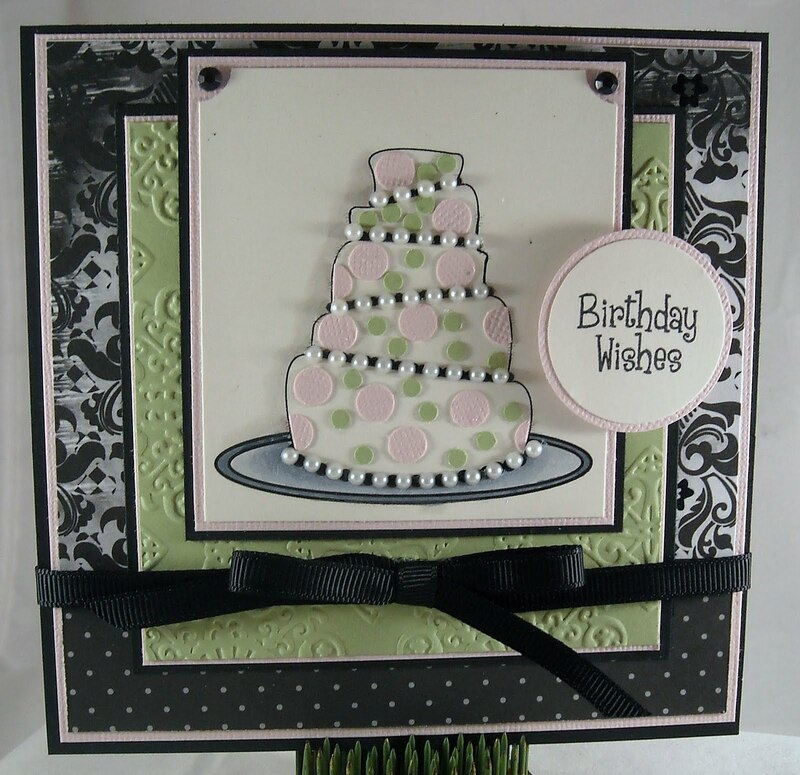 Sweet 'n Sassy Blog Hop!